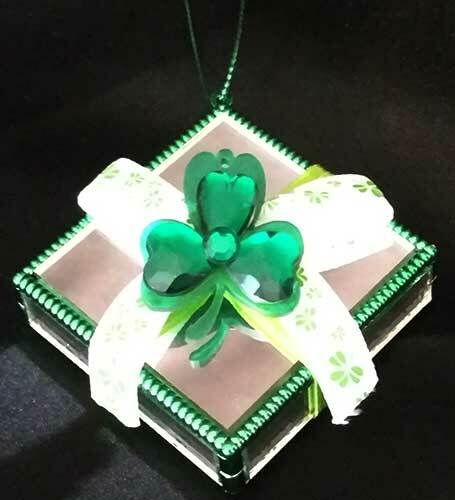 Irish Christmas ornament is a mirrored gift box that is enhanced with shamrocks. This Irish ornament features a mirrored square gift box that is enhanced with a large shamrock on the lid along with shamrock accented ribbon. The shamrock box ornament is made of glass and metal along with resin and fabric and it measures 1 7/8" square x 1/2" tall; please note that the box does not open. The Irish box ornament is ready to hang on your Christmas tree with the included green cord and it is gift boxed with a shamrock history card, complements of The Irish Gift House. Irish box Christmas ornament is a mirrored drum shaped design that is enhanced with shamrocks. Irish Christmas ornament is a mirrored box that is enhanced with shamrocks.